Aren’t there times when you’re sitting in your serious Herman Miller chair, staring at a serious spreadsheet for a very serious budget when you look around to find everyone else in the office adrift in a sea of serious cubicles–aren’t there times like that when would you like to do something un-serious? Like spray painting graffiti on your PC or putting whoopee cushions on all the boardroom chairs? But no. That would get you fired. And there is a way–a non-destructive, unembarrassing way, using your own computer– to take a stand for individuality, something that declares I am not simply a corporate flunky! That something is an animated cursor. Not the few token animated pointers Microsoft buries in Windows. 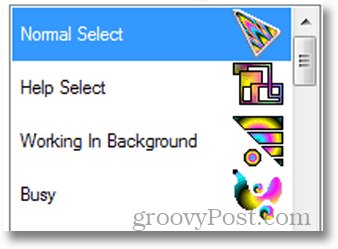 But some wild, passionate cursors like we tell you how to find in Animated Cursors Give Relief to Overworked Eyes. Check out that tip, and the site we recommend for the coolest cursors, Anicursor. Pick a pack o’ pointers that seem to express the inner non-corporate adventurer that lies within you. It will make things easier if you save the cursor to the same folder where Windows keeps its own, drab pointers. For the normal Windows installation, that’s C:\windows\cursors. And it will make things easier still if you jot down the names of the cursors you envision for the normal pointer, hour glass, busy, etc. I’ll explain why in a moment. 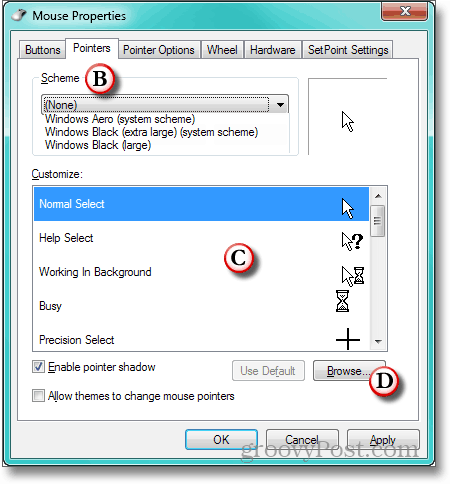 A – To open up the dialog box where Windows handles pointers, and click Start, Control Panel, and Mouse. 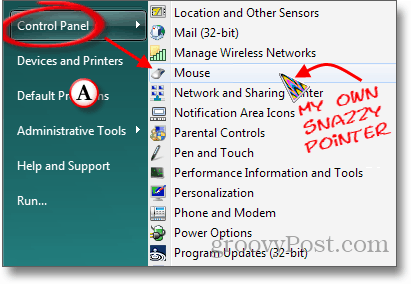 B – In the Mouse Properties box that opens, click the Pointers tab. This opens a box in which the Scheme section displays the name of the current collection of pointers “(None)” in this instance. Clicking the down triangle at the right end of the Scheme name place produces a drop-down list of other schemes that are available. C – The large Customize box shows you what cursors are assigned to the various Windows functions. One at a time, highlight the pointer you want to change. D – Click the Browse Button. E – Windows opens the Browse dialog in the folder where pointers are kept (and where a few minutes ago, you put the cursors you downloaded). Click the Type column heading. 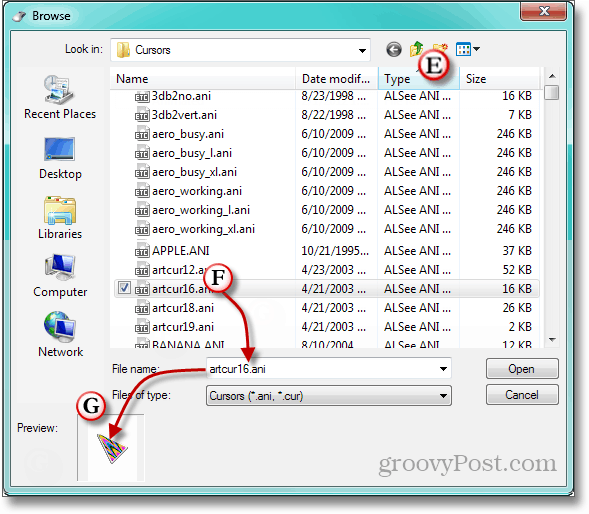 This sorts the cursor file list by the name of its extension. Because the extension for animated cursors is .ani, this brings all the animated pointers to the top of the list. F – Unfortunately, Windows does not show you what animated cursors look like in a browsing list. This is why I suggested writing down the names of the cursor you want to use. Select the one that you want for the pointer you highlighted in Step C.
G – Check the Preview window, which shows your selection and its animation in the lower left. Make sure the cursor is the one you want. If it is, click Open. 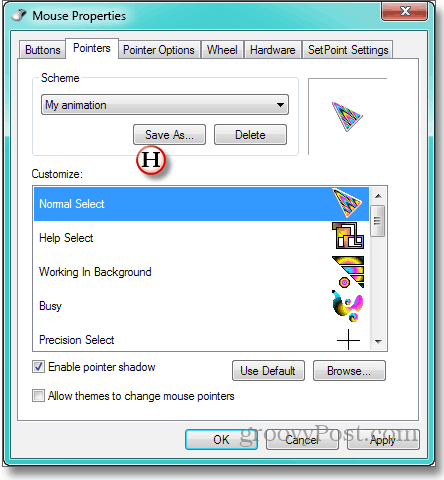 H – The animated cursor you chose will be shown in the Customize box for the highlighted function. Continue with pointers for the remaining functions until you’ve turned what had been a little weed patch of cursor into a colorful garden with colors that sway in the digital breeze. Don’t forget to name your collection so you don’t have to do this all over again.